Report from South Coast Area Council. The next bus trip is to Plants, Pots and Trains on 5th May. Tickets will be on sale at this meeting, don't miss out the bus trips are very popular. The next walking group excursion will be on the 2nd May and will look at some of the interesting and historic parts of Wollongong. The group will meet in the Dapto Railway Station waiting room at about 10:10am to catch the 10.20am Wollongong train. If you are late we will be upstairs in the second carriage. Please join us, you will be made very welcome. 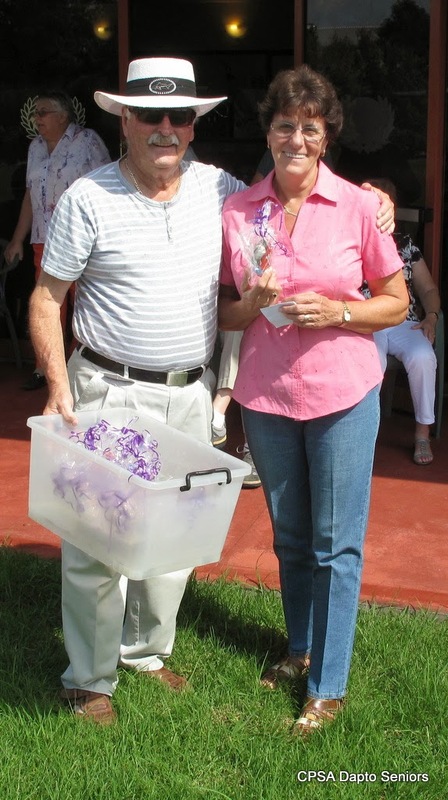 The club's annual picnic was held on the 30th March ant Integral Energy Park just outside Dapto. There was a terrific turn out of members to this event who enjoyed a chicken dinner, quizzes, lots of friendly company and afterwards were able to demonstrate their athletic skills with a game of Boules and throwing the rolling pin. A great time was had by all and judging by the happy faces everybody will be back next year for the next social outing. The winner of one of the competitions is presented with her prize by the club's President. 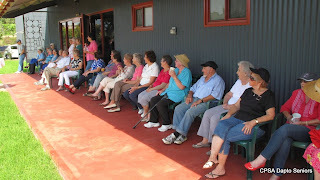 Some of the group enjoying the sunshine as they watched the outdoor events.